If someone has eutress it supports his/her mental development and learning of new skills. It is so called optimal level of stress as illustrated in the figure below. Are there any ways to measure that you are within these limits of eutress in that curve? For my experience it is quite difficult to detect that you don't go to the distress side of that curve. Only things that I know to measure it is resting heart rate and sleep quality, but I would like to know if there are some other ways to do it also. The term eustress was coined by endocrinologist Hans Selye, consisting of the Greek prefix eu- meaning "good", and stress, literally meaning "good stress". There is also the Yerkes–Dodson law which is an empirical relationship between arousal and performance dictating that performance increases with physiological or mental arousal, but only up to a point. The curve diagram you provided in your question is a rehashing of the Yerkes–Dodson law curve (Yerkes & Dodson, 1908) — See also Diamond, et al. (2007). This version is the most common version and often incorrectly cited in text books (Source). Are there any ways to measure that you are within these limits of eutress in that curve? Well detection of peak eustress levels would be practically impossible and one person's eustress levels can be very different to another person. 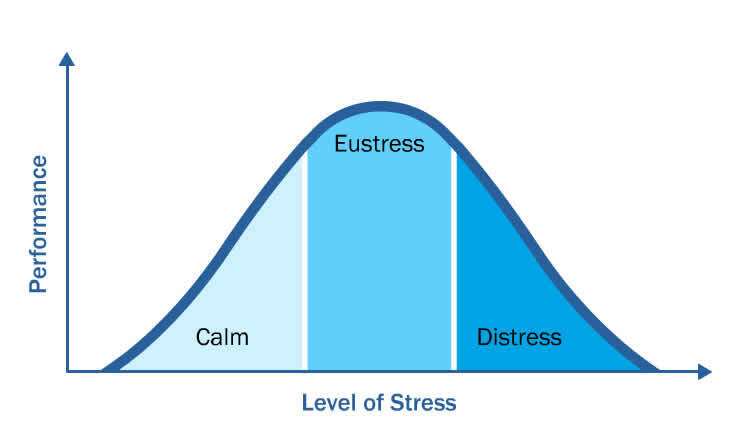 Selye's concept of eustress or “good stress” appears to be largely ignored in the literature, while the Yerkes Dodson Law is illustrated as a model for management practice. We suggest that the meaning assigned to the word stress has shifted from Selye's original formulation, and that this shift, in conjunction with the use of the Yerkes Dodson Law leads to inappropriate management of stress in organizations. We conclude that the concept that some stress is good and enhances performance should be rejected in favour of more useful and accurate concepts (Le Fevre, et al. 2003). From the point of view of the individual, it is only they themselves who can manage, through perception and interpretation, to what degree they experience their organisational environment, including its demands and resources, as distress or eustress. They are themselves responsible for their eustress or distress. As such, it is the individuals’ responsibility and choice to reflect on, and manage their interpretation of the stressors inherent in their occupation, and to endeavour to make interpretations that increase eustress and decrease distress. From the management standpoint, it seems to us that a key contribution of management lies in assisting employees to experience the stressors of the workplace as eustress. First, when employees can be supported to make positive interpretations of their environment, support should be given. This may necessitate investment in coaching and a variety of related personal development interventions. Second, when demand and resources can be modified to reduce stressors identified by employees as distress, then management should seek to address these stressors. Management should not assume that any particular stressor is experienced as eustress or distress but should rather engage in understanding the employees’ experience of the stressor. Diamond, D. M., Campbell, A. M., Park, C. R., Halonen, J., & Zoladz, P. R. (2007). The temporal dynamics model of emotional memory processing: a synthesis on the neurobiological basis of stress-induced amnesia, flashbulb and traumatic memories, and the Yerkes-Dodson law. Neural plasticity, Vol. 2007. Le Fevre, M., Matheny, J., & Kolt, G. S. (2003). Eustress, distress, and interpretation in occupational stress. Journal of Managerial Psychology, 18(7), pp 726-744. Spector, P.E. 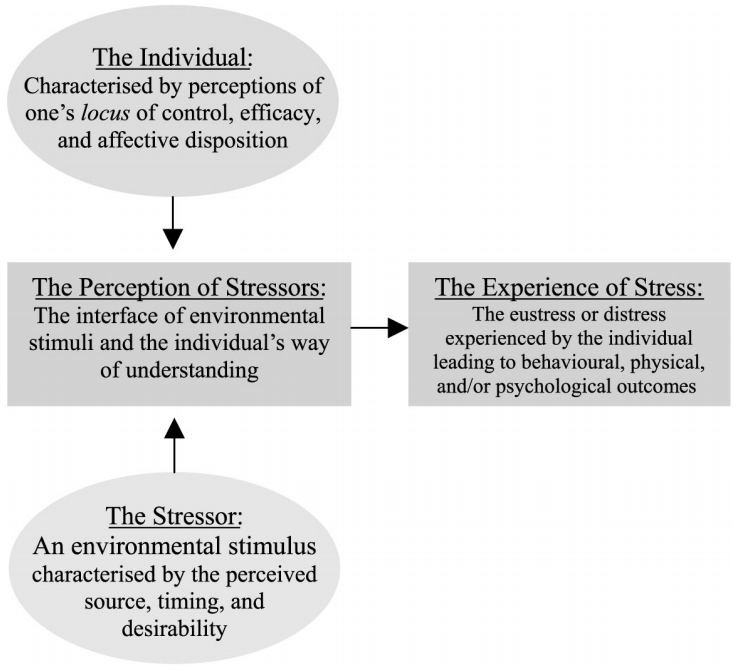 (1998), A control theory of the job stress process. In: Cooper, C.L. (Ed. ), Theories of Organizational Stress. New York, NY: Oxford University Press, pp 153-169. Yerkes, R. M., & Dodson, J. D. (1908). The relation of strength of stimulus to rapidity of habit‐formation. Journal of comparative neurology, 18(5), pp 459-482. Not the answer you're looking for? Browse other questions tagged well-being stress or ask your own question. Can drastic changes in stress levels impact long-term memory?